I have been thinking about my lack of Fair Isle ability. This is going to be remedied soon, I hope, as I have signed up for an evening class, but my aforementioned lack of skill does not stop me admiring and wishing to cast on all the colour-work yoke sweaters and cardigans in the entire world. The traditional Fair Isle yoke sweater and cardigans have never truly gone out of style in Shetland. 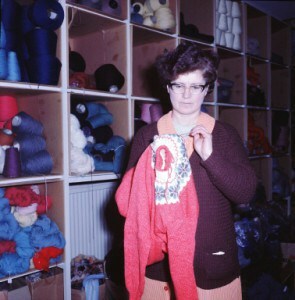 I was really struck by this when watching a news compilation show on BBC ALBA (great TV station, if you have access to it watch it and support it) and it showed workers at one of the Shetland woollen mills attaching hand knitted yokes to machine knitted garments in the late 70s. The very same style of sweater is just as popular today – usually 25 row tree and star patterns – and available from the same local shops who have been selling them since the 60s and 70s. Fair Isle yokes adorning chests from the very young to the very young at heart – it even forms a part of some local bridal attire – not only is it aesthetically pleasing, it is a lovely nod to Shetland’s knitting heritage and the enduring nature of the patterns and style. Very recently my lovely friend, Kate, posted pictures of her version of this classic design; she gained inspiration from seeing a Shetland girl wearing one in Jamieson & Smith. Can I tell you, I did actually emit a squee when I saw her pictures. There is such a charm to yoked sweaters and their appeal only just swells with the abundance of recent designs and garments making a feature of this construction. Entrancing colour designs of the Bohus tradition, which came out of Sweden in the late 30s; broad, deep, bold patterns of the Icelandic lopapeysa – actually only made popular in the 1970s, rather than being a traditional garment; traditional Fair Isle patterns, and more contemporary design – this style is visually striking. Even jumpers with circular yokes that aren’t garments in the traditional sense appeal, as these lovely felt brooches from Donna Smith illustrate. Of course, we all know stockinette catatonia and the never-ending sleeves, but she is so right! Joining the sleeves to the body and beginning that sequence of undulating short rows or carefully calculated decreases – creating your shoulders and curling around into a flattering neckline; watching your pattern form – it’s part of why I love knitting! If you opt for the top down method, what is more delightful than creating the most exciting bit of the garment first and watching the circle grown outwards? Its a bit like watching a flower open up. Of course, circular yokes aren’t always colour-work. Kate Davies’ Owls sweater has been knit over 7000 times, according to Ravelry. The cheery cabled design is indicative of that charm and allure of a circular yoke; one’s eye drawn around to appreciate each curious owly face and his buttoned eyes. Regular readers of the blog will know of my love of Tin Can Knits patterns – their Antler cardigan also features a striking cabled design. 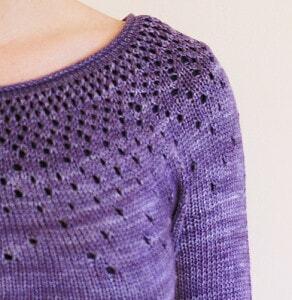 I adore their Raindrops sweater (above), which uses sublimely simple openwork to create a really pretty feature. 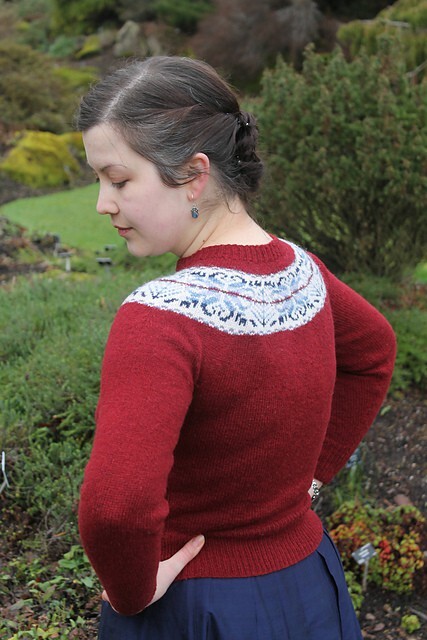 A yoke sweater on my knit wish list is the flattering cabled scoop of Ysolda Teague’s Lauriel. It was thanks to Ysolda’s book Little Red in the City that I learned I could knit and wear a yoke sweater to suit my shape. My first attempt at a colour yoke (in the featured image, and on me now!) was very deep. The pattern begins under the bust and – while I love it and wear it often – it emphasises my girls in a not very flattering way, broadening and flattening me. (It also shows my troubles with tension on colour work, but again, something I hope to remedy soon!) It was revelatory to discover that a shallower pattern could fit, flatter and not make me look like a sack of tatties. For this reason – and the fact that the motif is heart-gladdening – I will definitely knit myself a Chickadee one day! Whether you love the construction or the shape of the garment it creates; whether you like to experiment with intricate colour design or prefer lace, or cables, or a plain knit and whether you like a crew neck or a deep scoop, I think there is a yoke sweater for everyone and in the last few months there has been a positive blooming of patterns appearing on Ravelry. 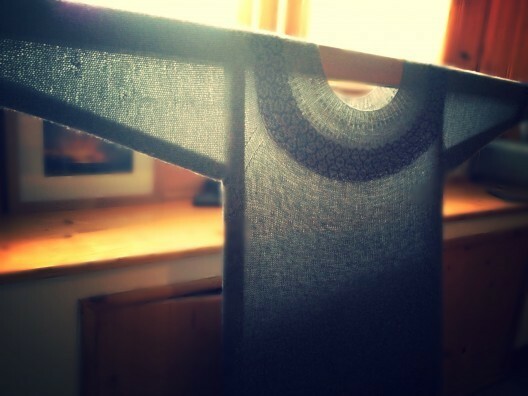 Wool + Bricks‘ Laddow is a beautiful contemporary example of the Bohus sweater. I adore the colours that Mirella has chosen to mirror the landscape and weather of the Peak District – and the fact that it is knitted in British wool and UK spun wool delights me, of course! Shown with the kind permission of the designer. Mirella has kindly offered a copy of Laddow pattern for one lucky reader. In order to win go over to the Wool + Bricks design page on Ravelry and comment on this post with the pattern that springs out at you! I will draw a winner at random next weekend, you have until Friday 31st to enter and as usual feel free to tell your friends. I also have a pinterest board too, should you need to feast your eyes on even more! 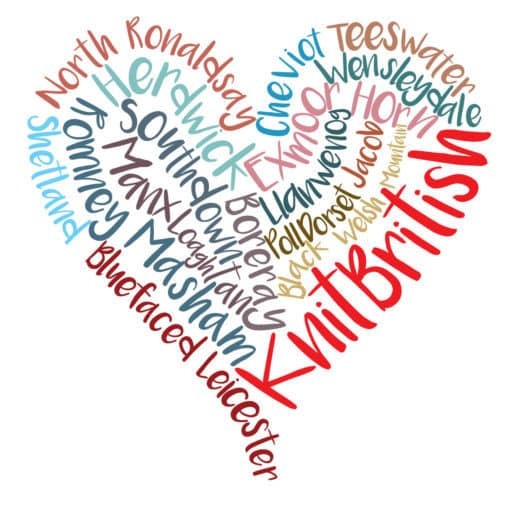 See you next time with the next episode of the KnitBritish podcast. now, what to have for breakfast? somehow craving an egg! 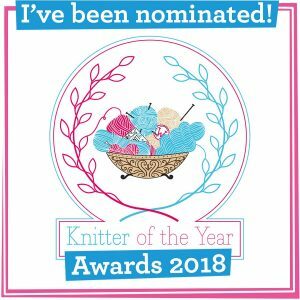 Thank you to Wool + Bricks for the great prize and to Kate and all the designers who gave their kind permission for me to show their alluring yokes! It’s not fair isle but I love the http://www.ravelry.com/patterns/library/maggie-may pattern. 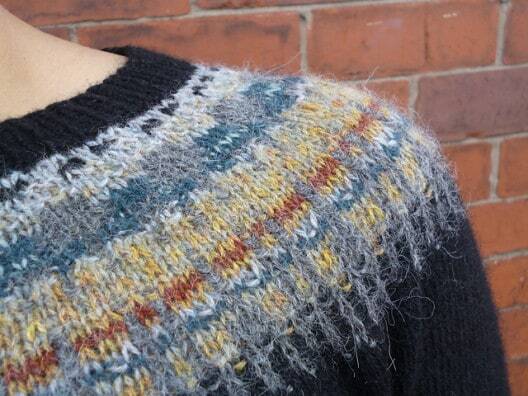 As for the fair isle, if I have to choose, I’d say the http://www.ravelry.com/patterns/library/laddow pattern. 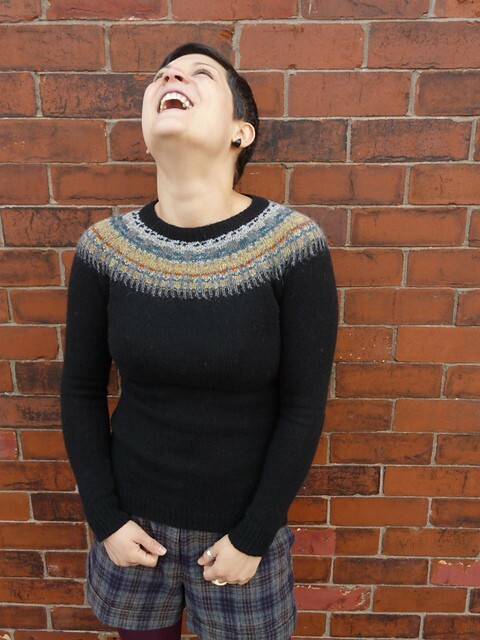 I steered clear of circular yoked jumpers for ages because I couldn’t imagine how they would work on my body type, but after knitting my Owls I am a total convert – it was so easy to add extra decrease rows so that I had a perfect fit at the bust *and* the shoulders! it is a bit of a revelation, isn’t it! You should enter the competition to win Laddow too! It has to be Laddow. Contemporary, but still has the Fair Isle look. The patterns are lovely! 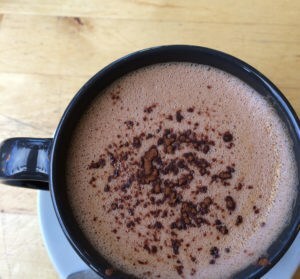 I would choose the Laddow, but the hottie cozy looks appealing on this cold winter morning. Thanks for introducing me to this designer. ps. I can’t link to your pinterest board, and I really would like to see it. Never mind! I found it. Great board! Hopwood for me! Amazing colours, detail on the sleeve and that neckline!!! I agree with you about the design by your friend Kate – stunning! 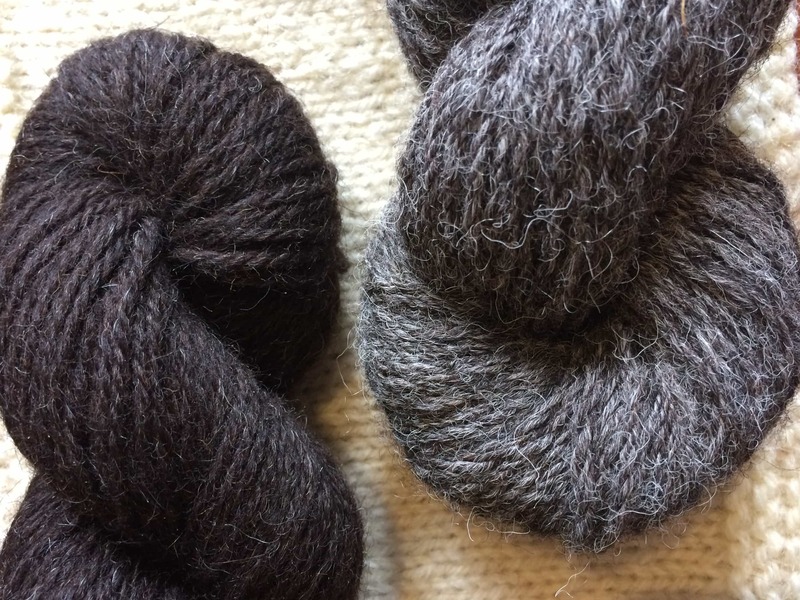 I found your blog via Wool + Bricks (only yesterday) and it’s really interesting to ‘wander in wool’ with people who are so creative. Never really thought too much about UK wool before, even though I grew up in Wales and there was a sheep farmer in the family. I had no idea what was out there to be honest. Yes! Get bitten by the bug! It’s great working with fibre local to your area! Thank you for reading and wandering along! Enjoyed your blog! Can empathise with knitter who hates knitting plain body and sleeves! Yoked sweaters are so beautiful and timeless. It would be such a treat to knit another one after a gap of over twenty years. I like the white leaf – I like fair isle but am a big fan of two colour patterns. It’s funny how I had a yoke jumper when I was peerie, it was a Lacey yoke that my Aunty Emma made for me to match my tartan pinafore, and I hated it! 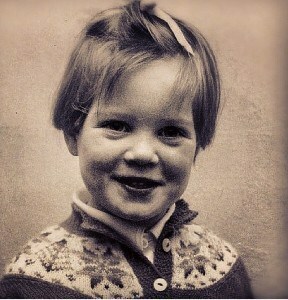 Now I wish I still had it as I would wear it now! I work with a couple folk who say they *had* to wear Fair Isle yokes as bairns so will not wear them now. Can you be so scarred by knitting? Maybe they were very rough! I love Mirella’s pattern – I have both a Maggie May and a Hopwood and I used to have a Haymarket hat but it was snavelled up by family. I’m keen to try my hand at a Laddow. Love the photo inspiration for the colours. I got a lovely set of dyes called “Mountain” that would work. Next stop yarn. I’m doing some research on North Atlantic knitting styles. If you don’t mind me asking, about how old was your Mam in the picture in this post, and roughly when was it taken? This information will not be published, but will help me figure out if the trail I am following is accurate! hiya. It would have been 66 or 67. Interesting article. Could you point me in the direction of where to find more information about fair isle and bridal wear? Im getting married next Autumn and am keen to knit a fair isle yoke jumper/cardigan (never done this before) and would love to do more research before I embark on this! I’m usually a baby knitter due to lack of patience so this will be a mammoth task!